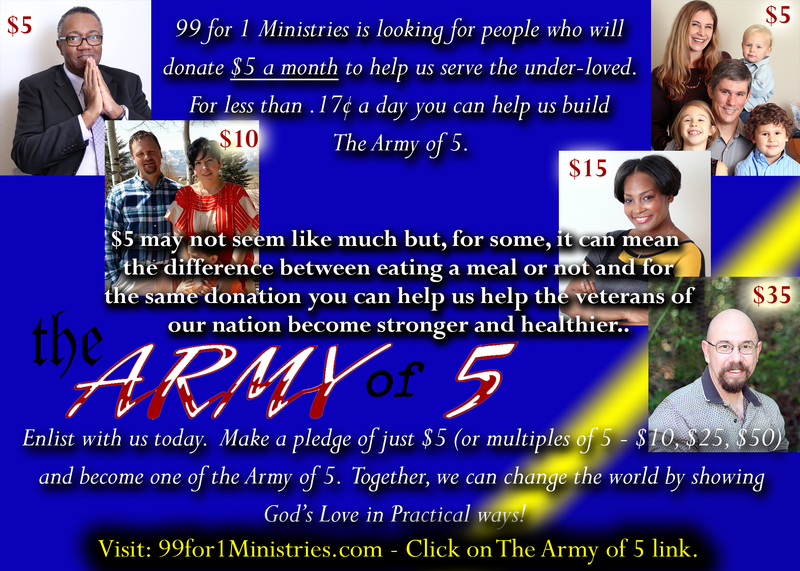 99 for 1 Ministries is looking for people who will donate $5 a month to help us serve the under-loved. For less than .17¢ a day you can help us build The Army of 5. $5 may not seem like much but, for some, it can mean the difference between eating a meal or not. Having now partnered with Eagle’s Landing (a facility that provides services to meet the unique needs of veterans who have served in our nation’s active military but who now find themselves homeless) we want to be able to provide when with equine therapy so as to help them with the stress and trauma brought about by war, reintegration into society, family interactions and life in general. With YOUR help (and the help of those you know) we’ll be able to do this. To learn more about out Equine (Horse) Therapy program, visit: Therapeutic Horseback Riding. Enlist with us today. Make a pledge of just $5 (or multiples of 5 – $10, $25, $50) and become one of the Army of 5. Together, we can change the world by showing God’s Love in Practical ways! It’s easy: Simply click on one on the Boxes below ($5, $10 or Other Amount) and each month, like clockwork, your Tax Deductible Donation will be withdrawn from your account. The automatic donation system is temporarily unavailable while we upgrde. For now, you may make a one time donation. This will allow us to plan for upcoming events, to get better deals from distributors to help feed, clothe and protect others and will enable us to have cash ‘on hand’ (in the form of our ministry card) to purchase fuel, groceries and other necessities people have. We’ve seen, first hand (time and time again) how much relief even five dollars can bring a person. That’s why building an army of five is so important to us. Thank you so much for becoming a part of The Army of 5!